Squirrel Proof! Priced right! Great Gift! 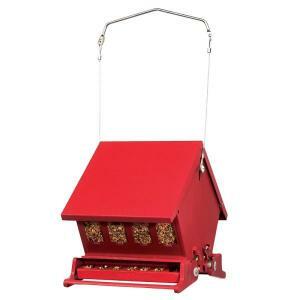 Heritage Farm Absolute 2 Mini Double Sided Bird Feeder has a great price and is squirrel proof too! Mini Absolute II offers two-sided feeding with squirrel-resistant, spring loaded perches. When a squirrel grasps the perch, a cover closes the seed supply. When the squirrel leaves, the perch and seed cover spring back up. Birds feed from a slotted tray that minimizes seed waste. Pitched roof lifts up for filling. All-metal with a red finish. Holds 4 lbs., 6-3/4 inch hanger, feeder is 6-1/2 x 9-1/2 x 8-3/4 inches tall. A great gift idea in bright red!